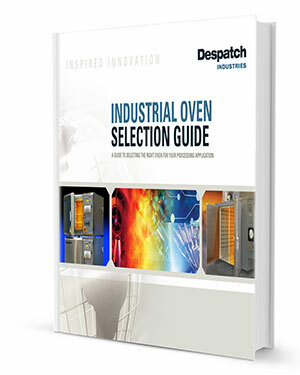 Despatch Industries is expanding its line of Class A Laboratory ovens with the introduction of the 12 cubic foot LFC2-12. The new larger capacity will be added to a line that includes a 3.8 cubic foot model with proven reliability in demanding production and laboratory applications such as curing, drying, sterilizing, aging and other process-critical procedures. The LFC Class A oven is specially designed to meet NFPA 86 requirements for applications that include flammable solvents or large amounts of moisture removal. They include a pressure relief panel, purge timer and exhaust fan. The LFC uses horizontal recirculating airflow to ensure uniform temperatures throughout the oven. A high-volume fan circulates air through perforated, stainless steel walls to create a constant horizontal airflow across all sections of the oven. The LFC features a microprocessor-based temperature and hi-limit controller with large LCD display and real time clock for auto start capability. Data-logging functionality enables reporting and analyzing and data files can be exported via the controller’s USB port. Modbus RS485 communications are included for easy data access. The LFC has a scratch resistant, baked enamel exterior, 304 stainless steel interior, and smooth door surface for easy cleaning. Servicing is easy due to convenient top access to the heater and fan. The Despatch LFC features sturdy, welded, double-wall construction, three inches (7.6cm) of glass fiber insulation and heavy-duty gaskets. Heating elements on the LFC carry a five-year warranty and all models have UL/C-UL listed control panels.